To get motivated and ready for the day, we met outside for a game of tag at 07:45. After everyone was awake and fed, we met outside for the opening ceremony which featured speeches held by important people. We got introduced to the groups of the rocket campaign, all of which were insanely cool, which made it very difficult to choose which group to join. 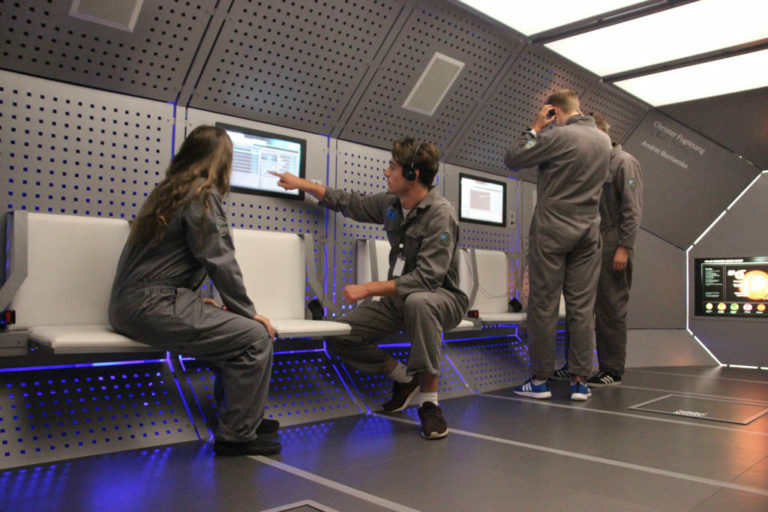 After deciding on our groups, we went on a technical tour of the Space Center, where we were showed lots of really expensive equipment by the group leaders. 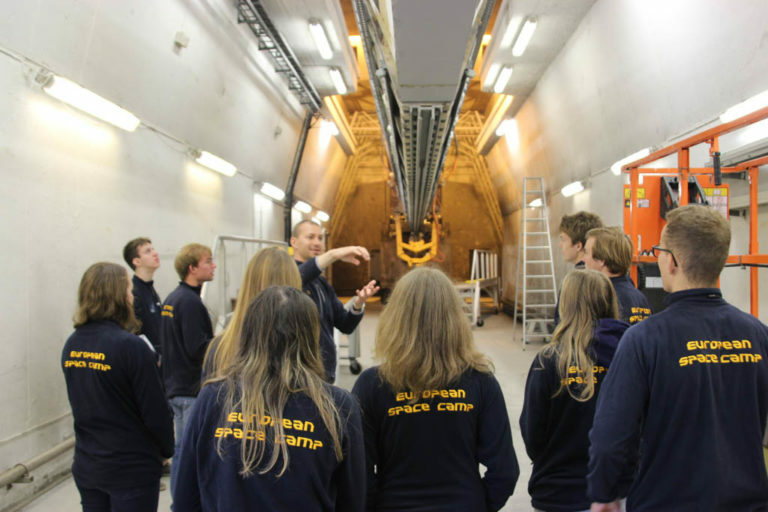 The tour included a hike to Alomar Laser Observatory. After some more food, we met in the living room for social activities where we ran into some Space Ninjas asking to help save the planet Mars. 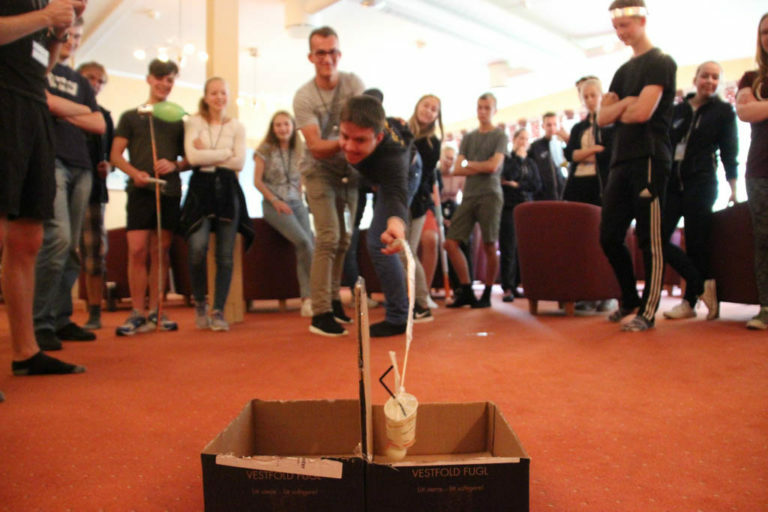 This was done by designing and engineering a device to move a bomb (closely resembling a ping-pong ball) from one side of a cardboard box the other, and back. 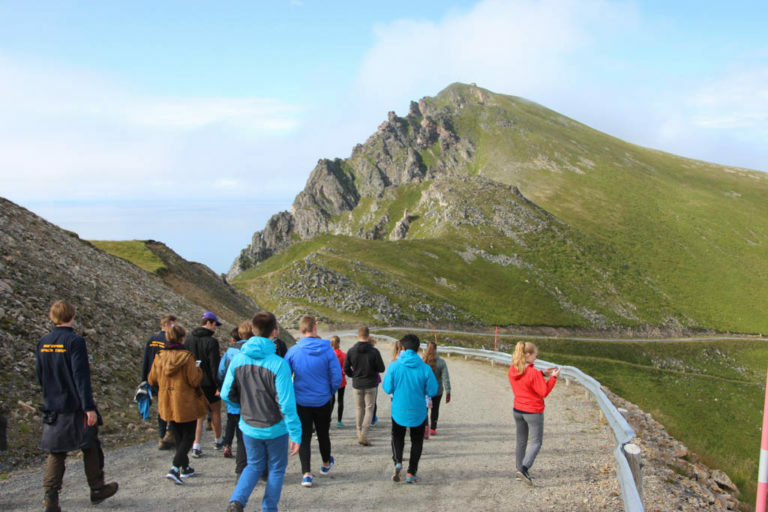 After the social activities some of us went swimming in the cold ocean, while the others were getting to know each other and further exploring the Space Center. This morning we were visited by the space ninjas again in order to become next level ninjas. After refueling in the canteen we learned about the northern lights, had a quiz and got to fly the Aurora Spaceship. 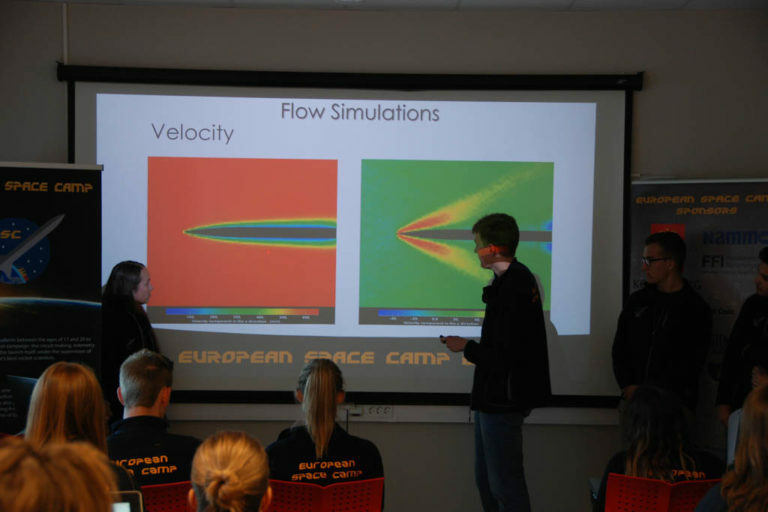 Then we had a lecture about the importance of physics and science by Alexander Biebricher and later on Rocket Physics by Christopher Stausland. We got to know our groups for the work on the student rocket and began working on our tasks. 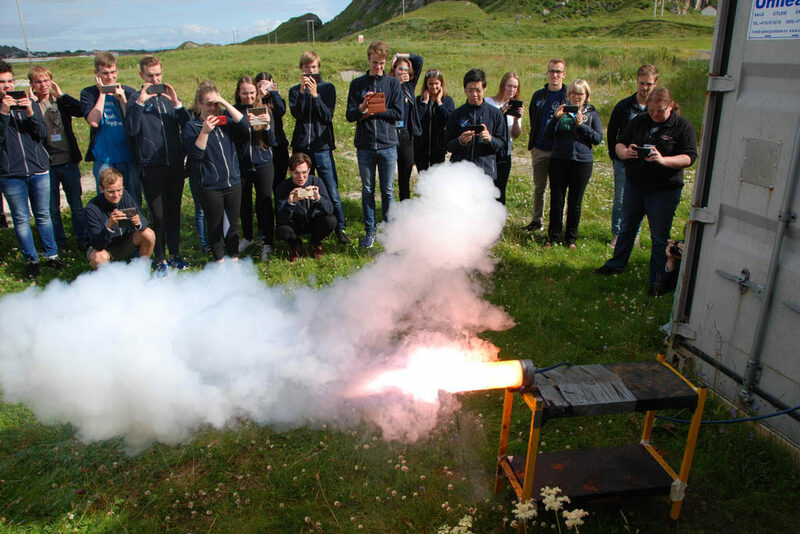 After this we were told to bring our jackets and meet outside for a GPS treasure hunt where we found codes hidden around the rocket range. Those we had to decode to find out where the treasure was hidden. Before the last meal we round up our day with another swim in the ocean and a nice warm sauna afterwards. Our new guests Sophie and Judith had brought an infrared camera so we were able to find out that we were about 15 degrees cold when we came out of the water. We are excited for the next days to come and hope we can keep up our swimming streak. To prepare ourselves for the day, the space ninjas visited us to teach us some ninja skills. 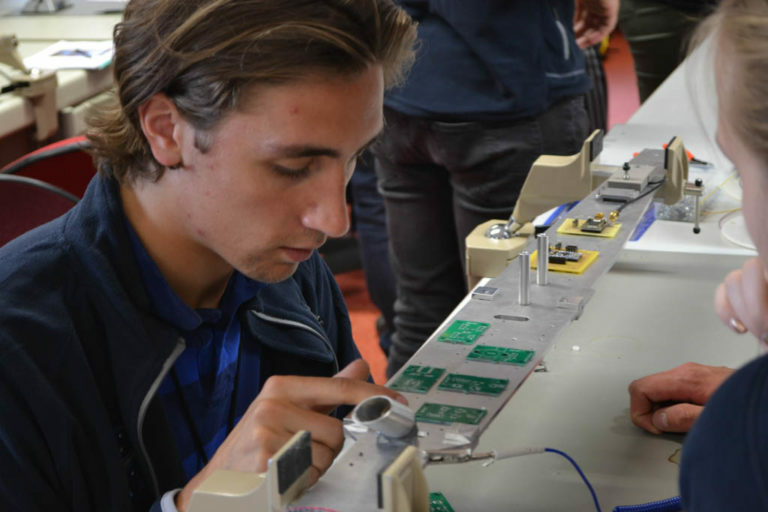 Then we had a lecture from Grunde Joheim about microelectronics in satellites. 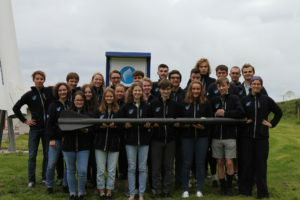 Then we set to work continuing our work in our rocket groups. 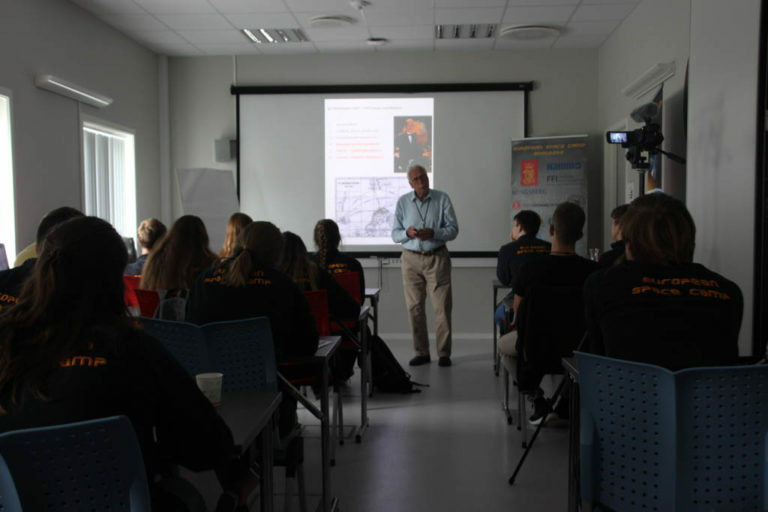 We then had another lecture from Space Camp Legend Ulv Egeland on Kristian Birkeland and the aurora. 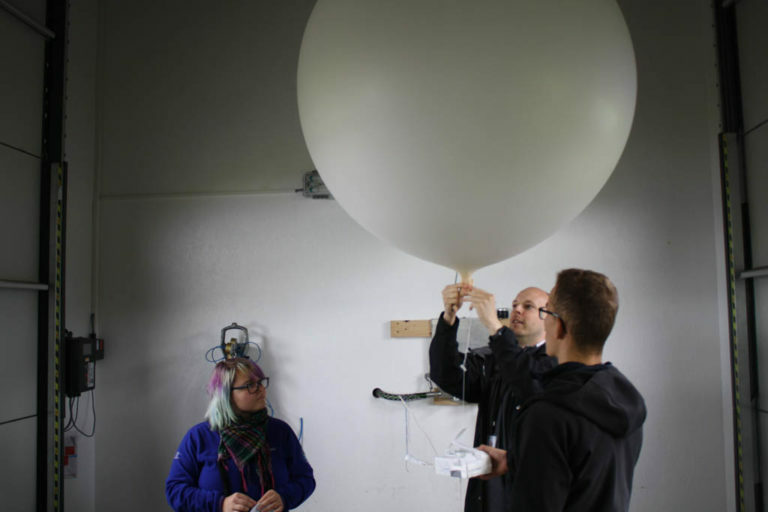 We then headed outside to watch the science team release the balloon to collect data around conditions for the launch. We continued into the evening working in our rocket groups. 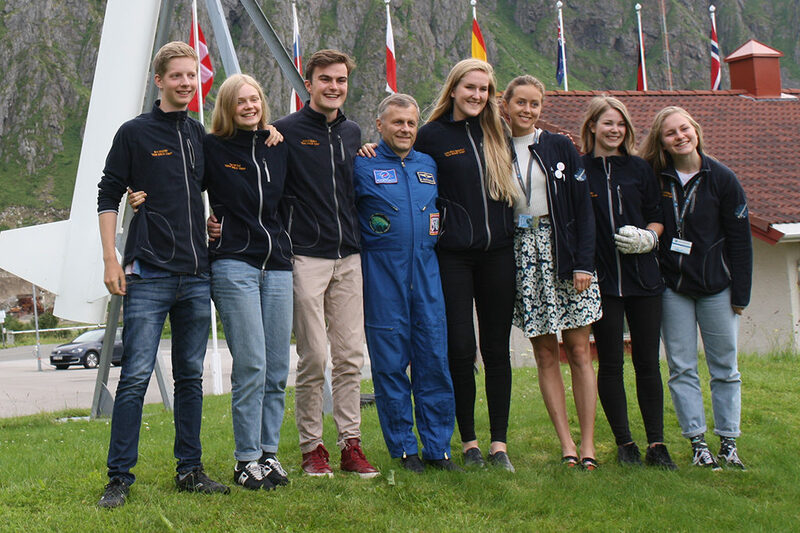 After dinner we were very excited to receive a lecture from Andrei Borishenko on his journeys to space, followed by an extensive photoshoot with the space camp crew. There was then a social visit to the shops to try the local cuisine! We started the day at an early 07:45, playing some weird game. 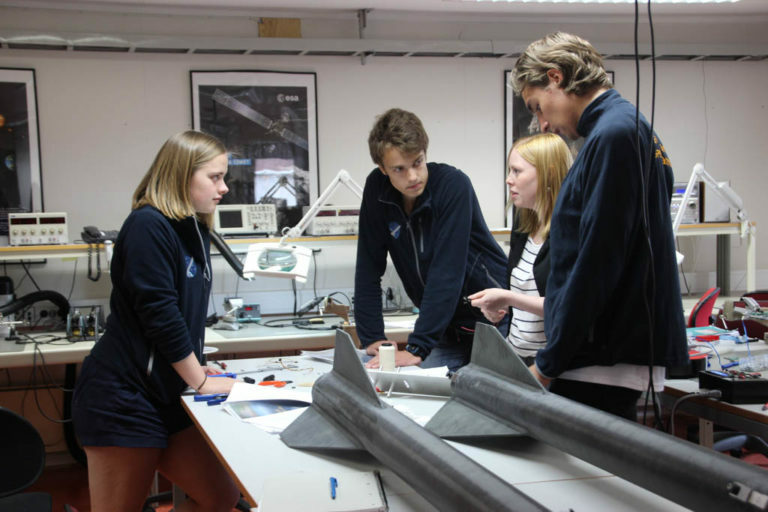 After breakfast the key part of our rocket campaign started – the launch preparation. We had an hour to finish the group work, which was followed by the pre-flight meeting and safety briefing. One hour before the launch everyone having important stuff to do rushed to their positions and the countdown started. Science group took care about cloud data, ships and planes. 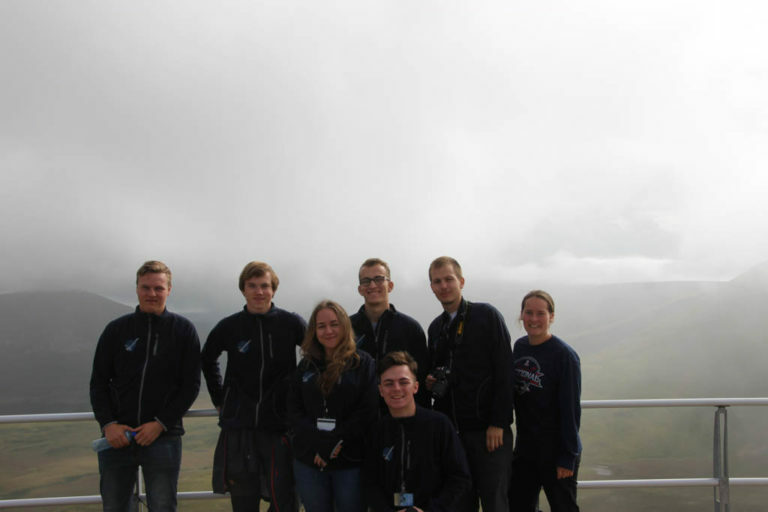 Telemetry group controlled the data income and set the antennas. Payload was put on the launcher and everyone left the launch zone. 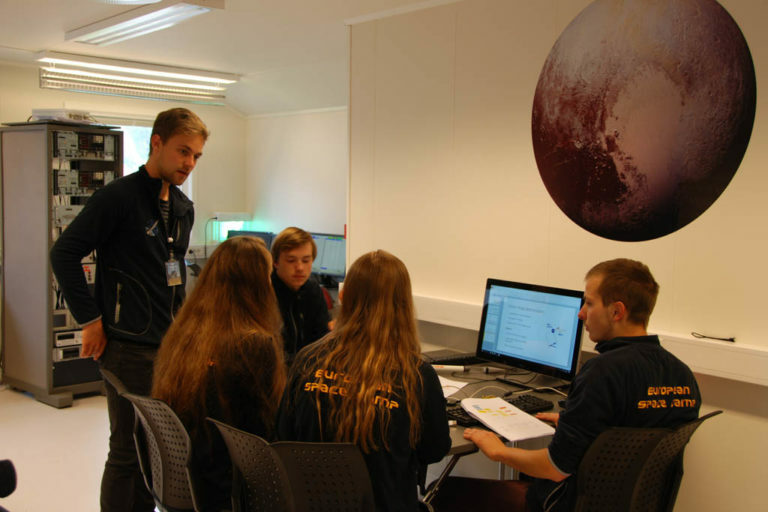 Many of us were standing outside of the Pluto Lab, accompanied by the lecturers and the cosmonaut Andrei Borisenko. Everyone was really excited!!! When the countdown finished, the rocket launched successfully, making everyone happy and satisfied. 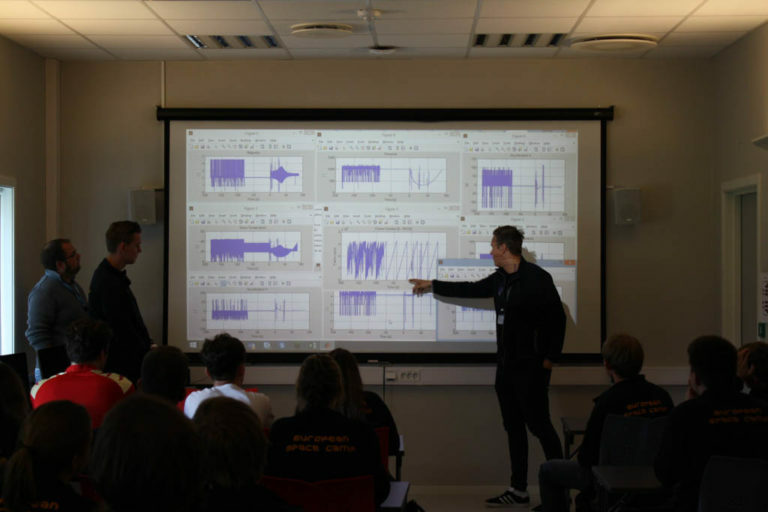 After lunch, the post-flight meeting happened, during which the operation was summed up and the first results were presented. It was followed by the lecture on the global energy. 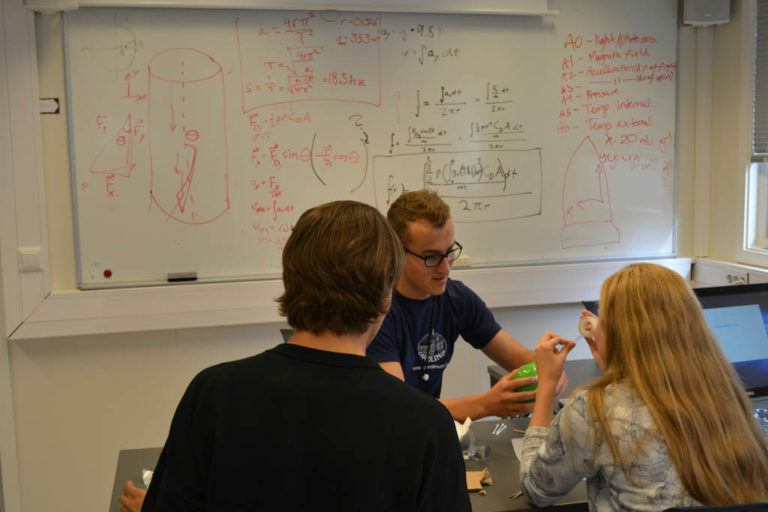 After that, data analysis started during the group work time, which lasted until supper, excluding the break for another lecture of Egil Lillestøl, who told us about the Big Bang, particle physics and gravitational waves coming from black holes collisions. In the evening some groups continued their work in order to prepare for the Friday´s presentations. 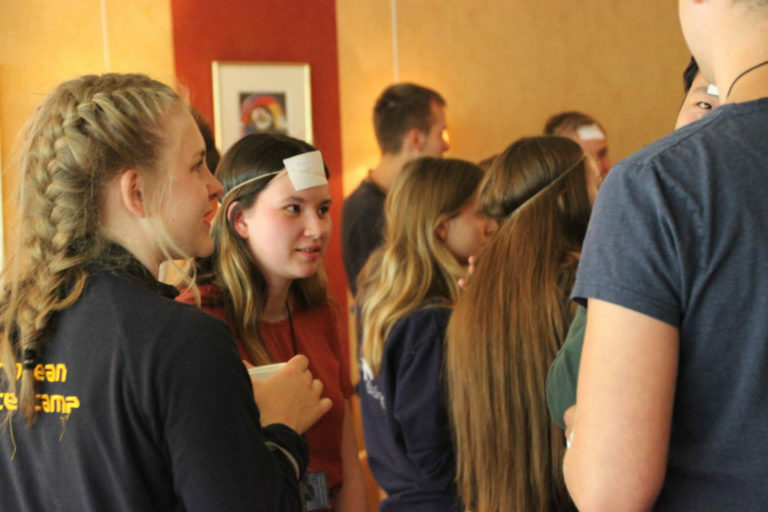 We started the day by forming various letters and shapes in groups for the morning gym session, and after we had untangled ourselves we had breakfast followed by two lectures from Rune Sandbakken. 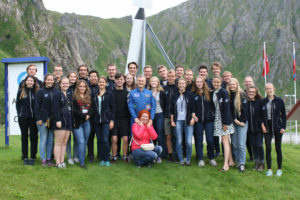 Rune is a leader in satellite communications, and in the first lecture talked about Norway’s prominent role within the satellite industry. 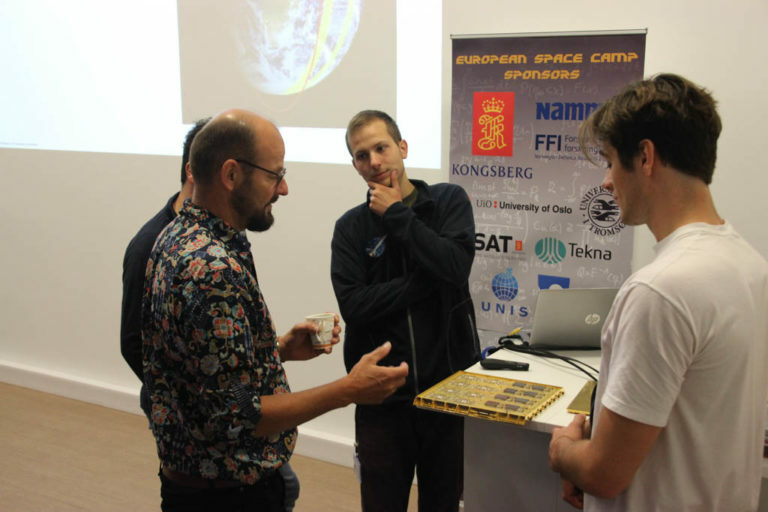 The second lecture told the story of the space race; from curiosities with fireworks in China to colonizing other planets, Rune prompted interesting discussions about human’s ever growing presence in the solar system. 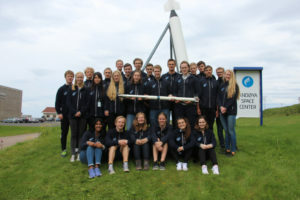 Afterwards, each of the rocket groups presented what they had done, in addition to showing the other groups their data and calculations from the rocket launch the previous day. Shortly after we had a NASA moon survival competition with Sophie Allan. Finally, after getting really angry with NASA experts’ prioritizations, we went to eat waffles. Furthermore, we did an engineering activity where we created a drop resistant device that was supposed to shield a balloon filled with an extremely important energy drink (water). Thereafter we had a barbecue, before we headed over to the living room. Here, the team had organized a dance competition, which was followed up by an awesome show. We were supposed to go hiking and see the sunset and sunrise, but due to bad weather conditions it was cancelled. However, this meant more time to socialize with the other participants and sleep. We started the day sleeping an hour longer than usual. For morning activity we had a morning bath in the sea. We were really woken up after this. After breakfast we had a lecture with Sophie Allen about possible life on Mars which was very very very interesting. We did an experiment with MARSmallows, and then Sophie showed us a piece of a moon rock and other asteroids, a piece of the Hubble telescope and Mars dust. We also created our own comet called Vania. We also had a chance to try a typical Norwegian meal called risengrynsgraut. Then we built paper rockets, and had a competition on which rocket that could travel the longest distance (the winner flew 104m!!). 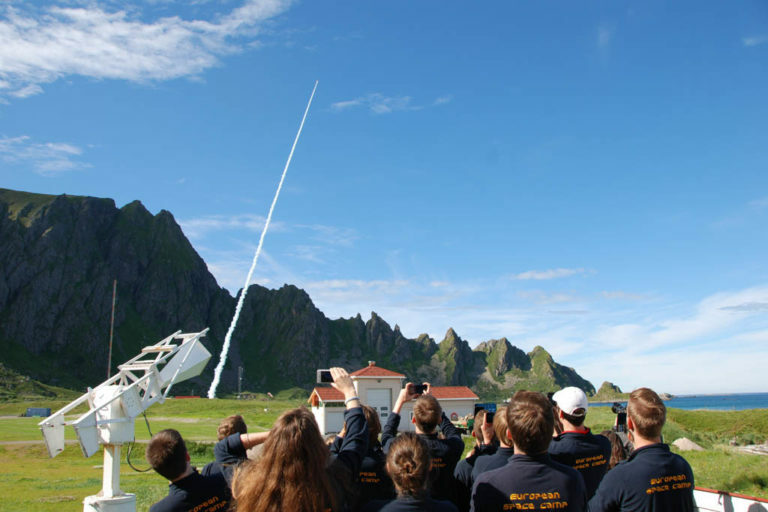 Later on, we launched our model rockets, some of which flew straight into the sea. 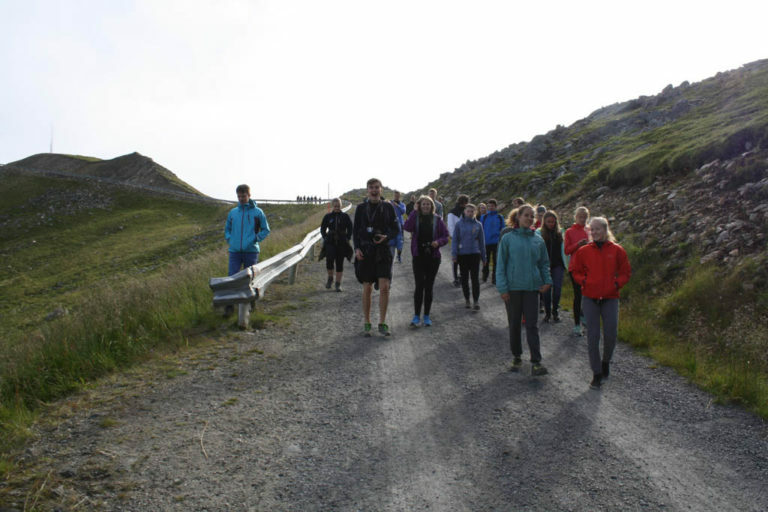 In the evening there was supposed to be a pizza party which ended up being an unexpected Andenes sightseeing, and the ESC show. It was fun. Every group had prepared a performance. The day finished with Bo’s moving movie, with memories from this week’s space camp. Really great movie Bo!! Jakob and Vania say thank you to Kamila and Frøydis for writing today’s diary. It was a pleasure to be here. Space Camp, you will be missed! Even after a late night with a lot of fun and good memories, we had to wake up by 8:00 for breakfast. Filled with food, but also really tired, we went to our rooms to pack all our stuff and check out. At 9:30 we went to the Auditorium where Nina held a presentation of the sponsors of the camp, followed by a beautiful, touching and emotional speech by Eoghan “the Eagle” Donald Gilleran as a closing ceremony. We then moved to Merkur/Venus where we got diplomas, a signed photo of cosmonaut Andrei Borisenko, some toyzz, a fabulous tee from NAROM, and warm hugs. For the final activity, we put paper plates on our backs and made all the participants and the wonderful team write something nice on it. Additionally, we filled in an evaluation form of the entire camp, where we gave our thoughts and feedback.